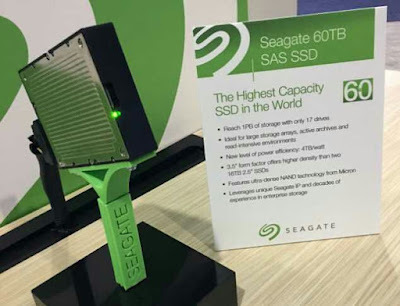 Seagate has just unveiled the world's largest SSD which happens to be a massive 60TB SSD. The new Seagate drive is almost 4 times larger than the Samsung's $10,000 per unit 15.36TB drive which was previously the world's largest SSD drive. Although this drive is not yet available for sale yet but Seagate announced at flash memory summit in California where the drive was unveiled that it will be available for sale by 2017. Some people might probably be wondering how large this drive is. To put it in actual sense, this drive can store up to 400million photos, 12,000 DVD movies or even 80 years of continuous high quality mp3 music. That's how massive this drive is. Even though the new Seagate drive uses the 3.5inch hard drive form factor compared to the standard 2.5inch SSD used by Samsung, Seagate claims that it's drive has twice the density of Samsung's and obviously 4 times the capacity. Considering the massive size of this drive and how much you can do with it, this drive will really come in handy for large enterprise usage. Although the drive is set to be released in 2017, the pricing and availability is not not known yet. But Seagate has promised that this drive will "provide the lowest cost per gigabyte for flash" memory available today. And if you really think this drive is large enough, then you might want to brace yourself for a more massive 100tb drive which might just be unveiled anytime soon from the same company.